Four Westbrook Junior College students stand shoulder to shoulder, backs to the campus Green, near a corner of Hersey Hall, in this sepia toned candid snapshot labeled '36 on the front. 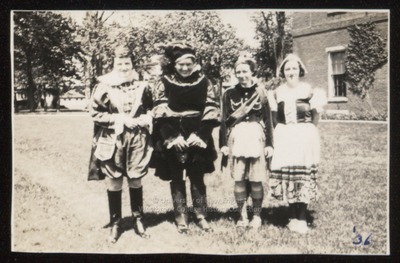 The four girls are dressed in May Day costumes. Three wear male Medieval nobility and page attire; one wears a peasant or Dutch dress, apron and cap. On the back of the photo is written in blue ink: Sheehy, Shaw, Wing, ? .